I saw the clip of Theresa May being questioned on her failure to appear in the BBC’s televised party leaders’ debate yesterday – and Martin Odoni’s observations in his Critique article ring true for me. Islam asked her, if May is strong and Corbyn is weak, why was Rudd at the debate instead? May followed up her laugh with a totally evasive answer, layered over with another of her favourite robotic catchphrases of “best possible deal for Britain”. The look in her eyes as she spoke was one of mortifying terror. It shows what an unbridled pig’s breakfast that the Tories in general, and May in particular, have made of their campaign, that even the BBC’s Chief Tory-with-a-press-pass, Laura Kuenssberg, can no longer tolerate trying to defend it. When she asked the second question, she simply re-iterated the first one, suggesting flat out (and correctly) that May is frightened of going head-to-head with Jeremy Corbyn. Watching this moment, it is clear that May was unable to stop fidgeting throughout. Her response, in a voice that sounded just a little too high-pitched and a bit too fast, was one of the most profoundly stupid, self-undermining remarks I have ever heard from a Tory politician – and the competition for that title is fierce. May said that taking questions from members of the public is part of the electoral process, hence why she was at this event in Bath, and not going to attend the televised debate. The reason this answer was so stupid should not need pointing out, but just to be on the safe side, I shall explain; the questions at the televised debate were all going to be asked by members of the public. There was also a likelihood that far more members of the public would get to see the televised debate than to see this press conference in Bath. Furthermore, the implication was rather insulting to Amber Rudd; if televised debates are really so unimportant, why is it fair to waste Rudd’s time by making her take part in them? May then followed up this imbecilic moment with a very nervous and painfully-unfunny attempt at a wisecrack about Corbyn not attending the ITV debate. The response of the ‘audience’ was so quiet, you could have heard an amoeba clearing its throat in embarrassment. I honestly get the impression that May is not only scared, she appears to be suffering from hyper-tension. She thought this campaign was going to be a breeze, but it has turned into a horrible, exhausting struggle, one in which she has lost every battle that she has been made to fight. The news in the opinion polls has been increasingly unhappy for the Conservatives over the last three weeks, and there now appears to be a serious danger that they are going to lose seats at the General Election next week. Perhaps even fall into a Hung Parliament. 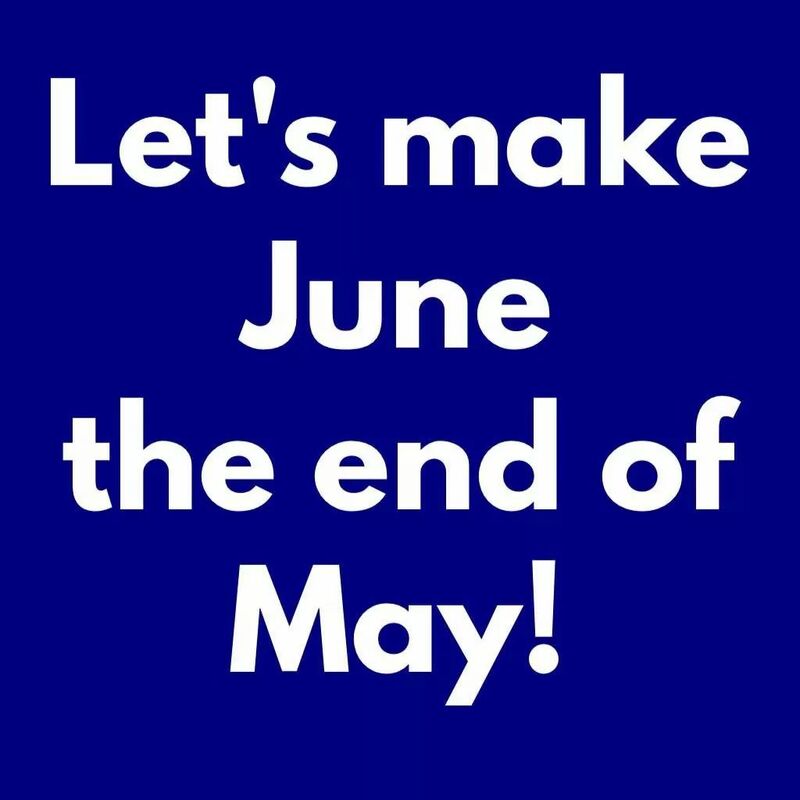 Given that May had three more years available before she had to call the Election, were the outcome to be a Hung Parliament, or even a reduced majority, this campaign would have to go down as one of the greatest-ever backfires in British politics. Martin goes on to add a few kind words towards Mrs May – that, watching the clip, he found himself feeling sorry for her. While I respect Martin’s views, This Writer has no such sympathy. Since May 2010, Theresa May and the Conservative Party have stamped on the poorest and most vulnerable people in UK society so hard that many thousands have died unnecessarily. She never spared a thought for these people’s feelings, or for their needs. I will not spare a moment for hers. The sooner she and the Conservatives are eradicated altogether from public life in the UK, the better. They are an ugly stain on our national character. This arrogant woman thought she was going to walk away with a huge majority without having to speak to real people. Having seen the interview she showed all the physical signs of a liar and a blustering, blundering amateur. What a shambles. JC4PM. Re: The sympathy, I have an ugly history of depression, so I can’t really help but feel at least a twinge when I see that same look in someone else’s eyes that I have often seen in the mirror – even when that ‘someone’ is a moral vacuum like Theresa May. thats understandable Martin but im with Mike on this. she and those who went before her. i,e, cameron IDS, osbourne ,grayling and that horrible woman from merseyside (forget her name now but she lost her seat ,unsurprisingly, i think it was at the LAST election?? .are all guilty of gross misconduct towards people like you with depression and other mental illnesses as well as physical disabilities. compounded with those are those on the streets because of bedroom tax and sanctions. im sure i dont need to go on. No member of the public will give her the time of day!!! Even a small child kicked the cardboard representation of her over!! That would humiliate me more!! I don’t see anything in her eyes but the bottom lip is getting a nervous workout. Also isn’t the election about getting the right exposure? Why should Jeremy go on every TV station when she won’t go one without it being completely controlled by her!!! Like Martin, I find it hard to view without a twinge of sympathy, but then remind myself that it was her who cynically called this election. Watching her face, the speed at which her expressions change is incredible. There is a psychological phenomenon called ‘pseudobulbar affect’ – this is it. Och, dear! I did wonder that something might be wrong with her. She doesn’t appear to have slow, or slurred speech, though. 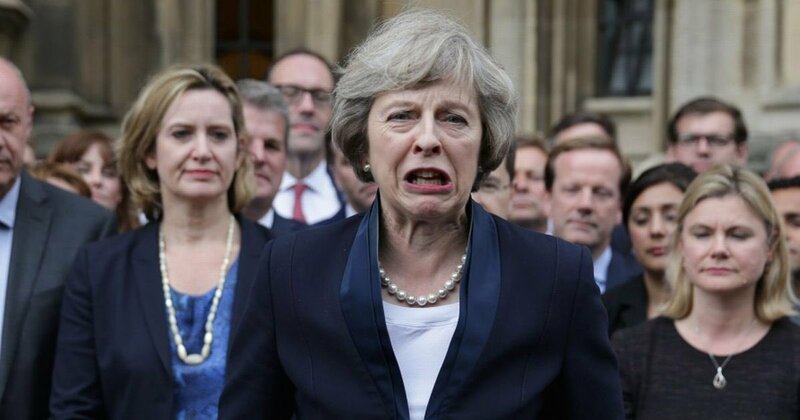 Much as I detest the Maybot, on a human level I actually felt sorry for her…..she looked absolutely terrified! Note the swallow in her throat after answering the 1st question as she turns to her ally, Laura, just for the same question to be repeated. She was horrified!